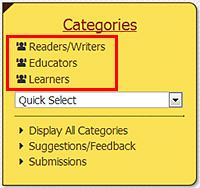 Registered Members at Learn Like Me™ are categorized intro three writer type categories – Readers/Writers, Educators and Learners. All writers have the ability to write or publish an article. Please go to the Writers page for a full description on writers. You can search articles written by a particular Writer in the following ways. Select ‘Writers’ at the top navigation bar. This will take you to the ‘Writers’ page which contains a list of all the registered writers. You can click on one of the writers listed and it will take you to the writer’s public profile page that lists all the articles that the writer has published at Learn Like Me™. You can also list writers based on their type category by pressing on one of the writer type categories located in the Categories panel. This will give you a list of all the registered writers for that particular writer type category. The Writer Type categories only appears in the Categories panel when you are in the ‘Writers’ page, Writer’s profile page or Writer Type Category page. You can access a Writer’s profile page anywhere where their username is shown as a link. This will give you quicker access to the list of articles written by a writer by simply going to their public profile page directly. These writer links can be found at the bottom of each article, search results, category listing, etc.. 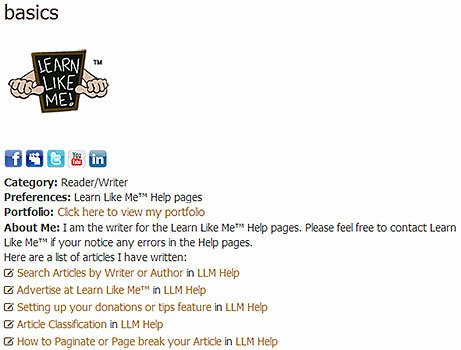 I am the writer for the Learn Like Me™ Help pages. Please feel free to contact Learn Like Me™ if you notice any errors in the Help pages.